Yeoal's Blogzine™| Nigerian Urban, Gossip and Entertainment Site: Gov. Adams Oshiomole to Run For Presidency in 2015? Gov. 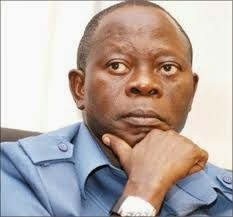 Adams Oshiomole to Run For Presidency in 2015? This is the story making the rounds. The current governor of Edo State is allegedly interested in running for the presidency; making it his second shot at the office. The first time was in 2006, but he later abandoned the idea and instead contested for the governorship position in his home State. Now that his 2nd term is almost over, he has decided to give his ambition of becoming the president of Nigeria another shot. The governor is said to have submitted letter of interest to his party, APC, to formally signify his interest in the elections which would take place in 2015.